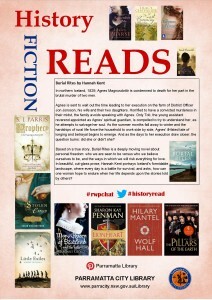 What is your favourite #historyread? Does history have to be true, or do you enjoy imagined histories as well? Do you enjoy historical romance, from real people, or people whose lives have been placed at another point in time? Does Steampunk excite you? Do you like reading historical maps? What history do you watch on dvd or films? Does it lead you to explore this history in other ways, by reading or watching other histories? What have The Tudors and Downton Abbey led to? Do you play games involving history such as Civilisation or Carcassonne or games which have constructed histories such as World of Warcraft? Historypin is another way of exploring #historyread, and the historic newspapers on Trove. While you are reading, playing or watching your #historyread, you might like to tweet about it using #historyread so that other people can have a conversation with you about your #historyread. You can add to the discussion on Pinterest too. There will be a live twitter discussion on 24 September starting at 8.00pm Australian Eastern Standard Time. 9.00pm New Zealand Time, 6.00pm Singapore Standard Time, 12.00 noon Central European Summer Time. Note : this is a staggered start to the discussion. 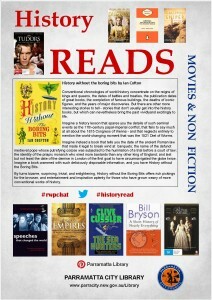 Use the tags #historyread and #rwpchat as you discuss the reading, watching playing that is your experience of historyread, so others can join in the conversation too. This entry was posted in Australian Authors, Fiction, Historical Fiction, Non Fiction, Recommended Reading and tagged Author, books, Parramatta City Library, reading by admin. Bookmark the permalink.